A community organization needed to define effective messaging and cohesive branding to better compete. The challenge was to create an overarching identity, mission and vision for all the institution offers—art exhibits, tropical garden, memorials for military veterans, art classes. Following a collaborative branding scoping session with board members, Merry Ann conducted a communications audit, with deep dives into social media and website analytics, reviews and earned media. This provided insights on audiences, site performance, brand position, messaging and keywords. A messaging analysis compared the client’s and top competitors’ primary messages and discovered areas of strong affinity, differentiators and confusion. These findings had “lightbulbs going on,” as board members put it. They realized they had competitors they previously didn’t consider competitors. Their brand’s primary messages didn’t reflect what visitors valued most. And there was an opportunity to shift brand positioning to capitalize on high interest in botanical gardens. 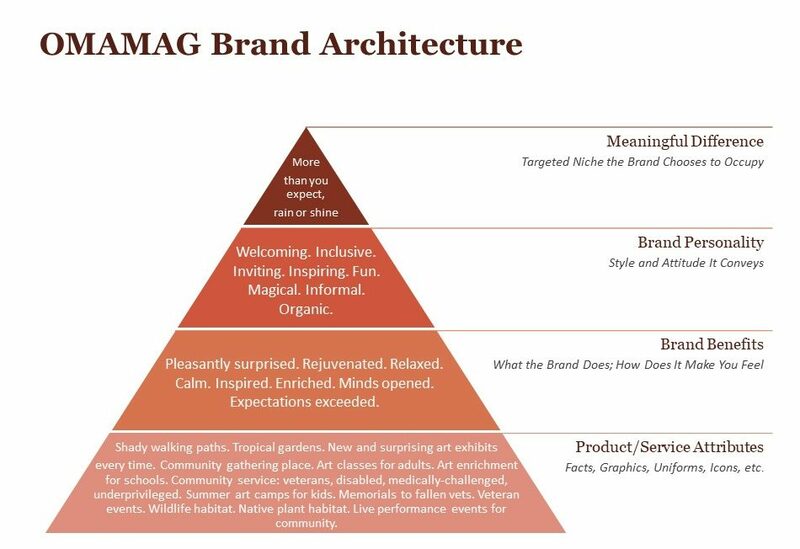 Brand architecture defining the organization’s Meaningful Difference. Message platform with new Mission and Vision statements that better explain benefits to the community. New tagline to encompass the full range of the organization’s work. Style guide to assure consistency in using the new brand. Coming up with data-driven messaging and branding for a nonprofit with a complex mission.